One pack of multi-colored construction paper. Poster Paper or Oaktag paper. One photo of a place that your kid enjoys like the pizzeria, the movie theater, or the comic book store. Take a sheet of paper and draw three rows from left to right. Title the first row “ Good”. Write “Caution” in the second row and “Bad” in the third. Use green construction paper to illustrate the “Good” column. This also helps your kid associate their feelings with color. Use yellow for “Caution” and red for “Bad” to emphasize levels of severity. Glue each colored column into place. attach a photo of your child’s favorite place at the bottom of the chart in the “Good” column. Then, attach a photo of your child’s favorite item in the “Bad” section. Now make sure to hang this chart somewhere in the home where its easily accessible and everyone will see it. Try placing it in a common area like a play room, living room, or even the refrigerator door. I use a 20 point scoring system. You’re free to alter this if you like. 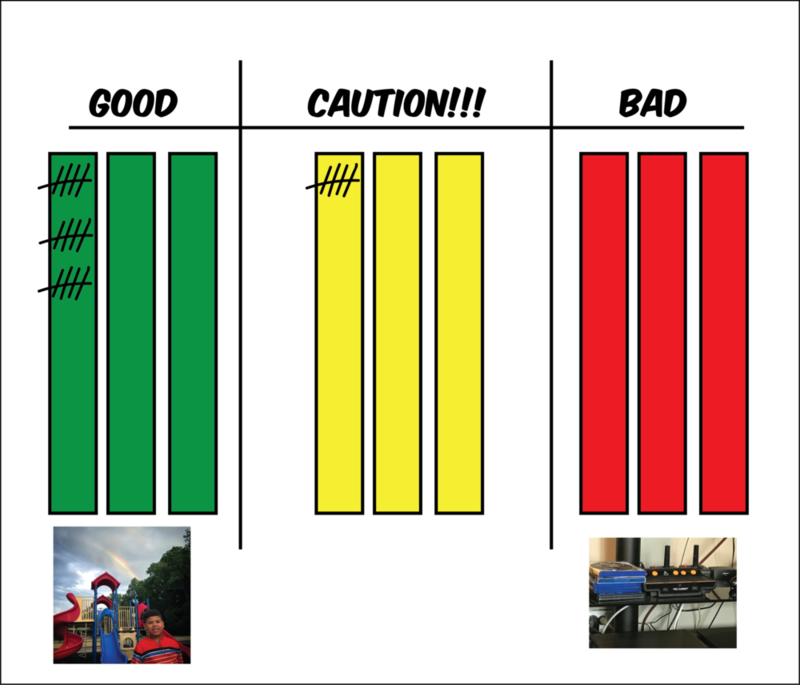 If Jake can reach 20 points on the “Good” side first, then we’ll do whatever is illustrated in the photo on the chart. If he reaches 20 in the “Bad” first, Then it’s no games, or tablet, or comics. I still use this chart to reinforce good behaviors. Since Jake learns visually, I use this as a means to teach him about the consequences of his actions.